Dromica kolbei? - Kruger National Park, South Africa. Copyright © Joe Warfel 2011. It did not fly, only ran, ran, ran, ran…. you get the picture. But stopped briefly now and then to deposit eggs in the soil. My best guess from my limited tiger beetle references is Dromica sp. Any help for identification you may give would be appreciated. Although I have not collected this genus myself, I recognized it instantly as a member of such based on specimens and images I have seen. Carabidae of the World contains fine images of a number of species in this genus, of which Dromica kolbei (W. Horn, 1897) seems to be a pretty good match. However, more than 170 species are currently included in the genus, and while a modern revision is in progress (Schüle and Werner 2001; Schüle 2004, 2007), the bulk of the genus still remains to be treated. As a result, this really should be considered as just a provisional ID. 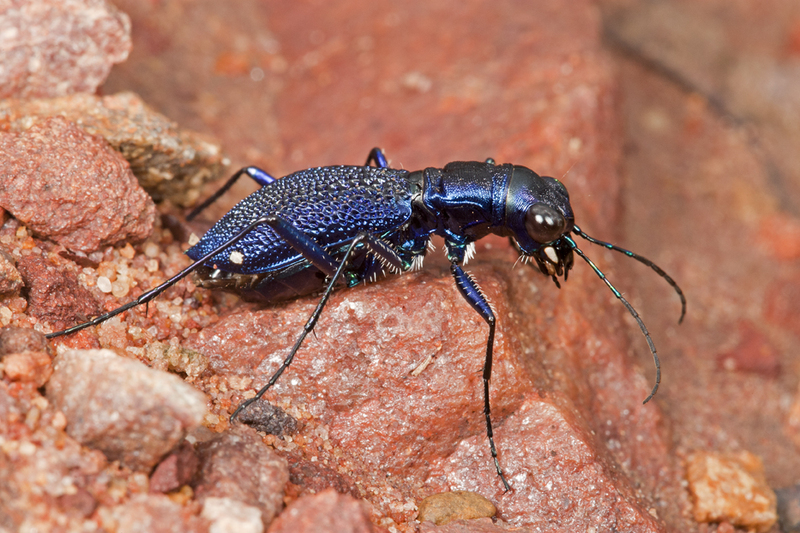 Dromica is a strictly sub-Saharan African genus of tiger beetles whose included species are denizens of dry lands – savannahs, grasslands, open woodlands, and semideserts, and are generally absent in the moister, more heavily forested areas of western Africa. Like a number of other tiger beetle genera, they have given up the power of flight to capitalize on their fast running capabilities. This flightlessness and the strict association of adults with often short rainy seasons has led to both spatial and temporal isolation of numerous, localized populations of restricted geographical range. This has no doubt contributed to the diversification of the genus across the mosaic of suitable habitats covering central, eastern, and southern Africa. Schüle and Werner (2001) suggest that a good number of new species may still await discovery in the more remote or yet inaccessible areas of the countries of occurrence. I had hoped to encounter these beetles (and also Manticora, or the giant African tiger beetles) during my visit to South Africa in 1999, but luck was not with me in this regard (although I did collect several fine specimens of the handsome Ophryodera rufomarginata (Boheman) and also a few species in the genera Cicindina and Lophyra). My sincere thanks to Joe Warfel for allowing me to post his excellent photograph. I featured photographs by Joe in an earlier post (A Tiger Beetle Aggregation), and his other photos can be seen at EighthEyePhotography (you must see this striking harvestman from Trinidad!). Schüle, P. and K. Werner. 2001. Revision of the genus Dromica Dejean, 1826. Part I: the stutzeri-group (Coleoptera: Cicindelidae). Entomologia Africana 6(2):21–45. This entry was posted in Cicindelidae, Coleoptera and tagged beetles, blog carnivals, entomology, guest photo, insects, nature, science, South Africa, taxonomy, tiger beetles. Bookmark the permalink. But then, I’m guessing that it’s not called Dromica (‘runner’) for nothing. The pitted elytra are really quite something! Pitted/heavily sculptured elytra seem to be a common feature of flightless, dryland beetles (ground beetles of the genus Cyphosoma, numerous tenebrionids, etc.) – I wonder if there is a functional relationship between this and aridity. So beautiful in all the details. Hi Jeff – thanks for the visit, and I’m happy to have found a good South African natural history site to add to my blogroll!